Sir – The latest Australian Bureau of Statistics National Account figures reinforce the perilous state of the Northern Territory economy. 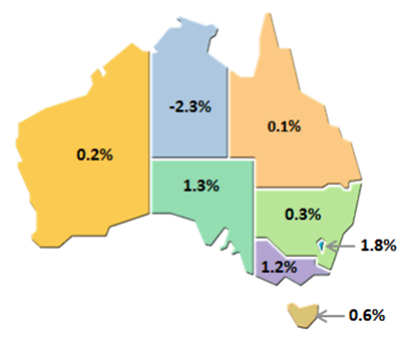 The NT sits a long way behind all other jurisdictions, at minus 2.3%, and is the only jurisdiction to record a negative State Final Demand figure for the June quarter. This follows a decrease in the March quarter, minus 1.7%. The largest detractor from growth was private capital investment driven by non-dwelling construction. These figures illustrate the urgent need for the Territory Labor government to abolish its hybrid mining tax and create an environment ripe for private sector investment in the Territory. Two periods of consecutive falling State Final Demand indicate that the local economy is in recession, and the decline is accelerating. The Opposition is concerned that things will get a lot worse before they get better. We are concerned for Territory jobs, and Territory families. Private sector investment means jobs, jobs for Territorians already here and jobs to attract people here to grow our population. IMAGE: June Quarter 2018 National Account figures, Australian Bureau of Statistics. Also just goes to show, what happens when you favour non-taxpaying businesses over private owned business, and use suppliers not based in the NT. Might be time for government to start to have a look at where they are spending “their” money. “These figures illustrate the urgent need for the Territory government to abolish its hybrid mining tax…”, such a tax will increase revenue. Your arguments about the economic issues with the NT are completely hollow considering you are anti one key policy that will increase revenue from the mining industry. Your party is irrelevant and hardly deserving of the title of Opposition.